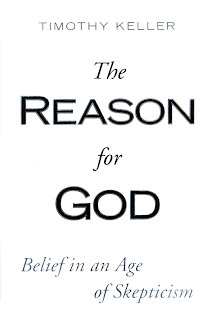 A Very Brief Review: Tim Keller’s "The Reason for God"
I like books on apologetics because not only do they serve me in evangelism but also build up my faith on a personal level. It’s nice to read the fruit of someone’s labor when that labor is given to sharing compelling reasons why a person should give their life to Jesus Christ. Toward that endeavor, there are fewer books I’ve read that are as good as Tim Keller’s The Reason for God. In fact, I would say only C.S. Lewis’ Mere Christianity would prevail in a apologetics arm-wrestling contest…and TK would most assuredly give Clive Staples a run for his money with 21st Century audiences. Thankfully they’re both on the same team (incidentally, Keller rightfully quotes Lewis often). In The Reason for God Keller is characteristically disarming, intellectually engaging and easily accessible. It deals with the “big” issues like suffering, eternal torment and science like other apologetical works but it’s done in such a fresh contemporary fashion that the Christian reader may feel he’s never heard this stuff before. Yes (all you who’ve read people like Ravi Zacharias, Hank Hanegraaff, etc. ), it’s that good! While reading the book leaves one with the impression that Keller is incredibly well-read if not brilliant it more so highlights the truth that, outside of Jesus the Christ, there is no name under heaven by which men may be saved.